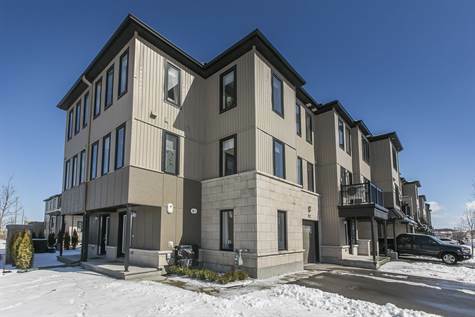 Style: Townhouse "Corner End Unit"
Garage: Single, Detached "Inside Entry - 3 Parking spots in total"
Lot Size: 46ft "LARGE CORNER END UNIT w/3 parking spots (2 sided by side ext & 1 in garage)"
ABSOLUTELY STUNNING 'Redwood Corner' END UNIT. 1447sqft featuring first level w/garage entry to family entrance, storage/utility rooms, media room/den, front entrance & foyer. The second level opens to a STUNNING white/grey kitchen w/subway tile backsplash & ceramic floor, breakfast bar island, stainless appliances, custom lighting & blinds, open concept dining/living room w/beautiful hardwood floors, powder room & convenient laundry room (with porcelain tile!). The upper level features 2 spacious bedrooms, 2 full baths/master ensuite, master walk-in closet & linen closet. Every floor is flooded w/lovely natural light pouring through the numerous tall windows. This unit features THREE PARKING SPOTS (2 side-by-side & 1 in garage w/inside entry). Lovely southwest views. Tastefully landscaped & totally move-in ready! Impeccably maintained throughout - you will be delighted!!! Demand HWT, central A/C, auto-garage dr opener, NEST thermostat. Offers presented Sunday, April 14 @ 6pm. Association Fee includes common area maintenance.